blue and pink dots ribbons, heart doily, Sizzix stars and pearls. Karkkihaaste /Mervi's Candy& Challenge 12.2. click the sidebar's picture! Lovely card. Adorable characters. Magnificent papers and choice of colours. Bravo ! Oooh, this is cute Mervi! The heart doily is gorgeous with the soft pastel colors. it's so cute!! I love this stamp! Onpas söpö kortti :) Kiva leimakuva! Lovely card. Thanks for sharing it with us at Crafty Ribbons this time. 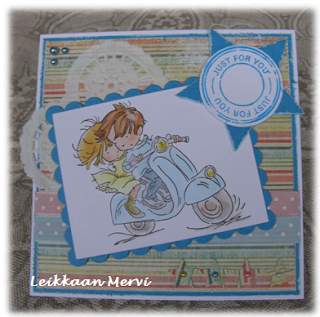 Gorgeous card Mervi, the image is adorable and I love the softness of the colours.